NEW YORK (CNNMoney) -- Facebook has long faced criticism for being too focused on the Web and neglecting its mobile products. On Wednesday, the social network shed more light on its mobile problems in an update to its IPO filing. A growing number of users are accessing Facebook on mobile devices, where the company doesn't "generate any meaningful revenue." Facebook's tally of daily active users is increasing faster than the number of ads served. Facebook, which filed in February for an initial public offering that is expected to take place next week, released the details in an update to its regulatory paperwork. Facebook had already warned potential investors about its lack of mobile monetization, but the stats on users' ramped-up mobile access were new. 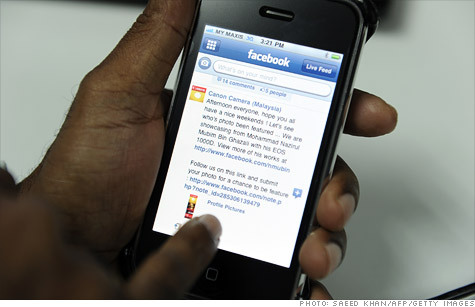 About 488 million monthly active users accessed Facebook's mobile products in March. Facebook wasn't built with mobile in mind -- it was created in 2004, after all -- and it's been slow to develop device-optimized apps. Facebook for the Apple (AAPL, Fortune 500) iPad wasn't released until October 2011, a full year and a half after the iPad debuted. Facebook's delay gave third-party apps a chance to jump in. In early 2012, Facebook introduced "sponsored stories" on its mobile apps, a move aimed at helping it generate revenue on a platform other than the Web. Critics say that's too little, too late. Advertising accounted for 85% of Facebook's total 2011 revenue, or almost $3.2 billion. To date, most of Facebook's ads have been display ads: banners, images and other graphics. Ignoring mobile for so long feels like an oversight. Now that Facebook is finally working on mobile products, the all-important next step -- monetization -- is slow going. Wednesday's filing wasn't the first time Facebook had to address criticism about its slow migration to mobile. During a private kickoff event for Facebook's pre-IPO road show earlier this week, investors spent a Q&A session grilling execs on when Facebook will make money on mobile. Zuckerberg admitted that his company is having trouble charting its growth in mobile and tracking its user base. In a Web version of the road show, which Facebook made publicly available, CFO David Ebersman said the company is in a "heavy investment" phase, and acknowledged that "mobile use of Facebook is critical to long-term user engagement." Mobile advertising is still in its early days, Ebersman said, and the space is lacking in innovation. As part of that investment, Facebook just shelled out $1 billion in cash and stock in a high-profile deal to buy mobile startup Instagram.